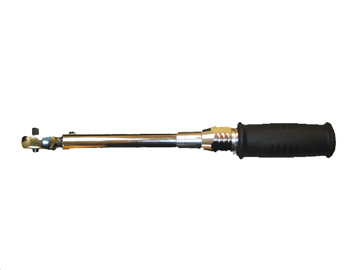 The 501CTPRH torque wrench is an industrial grade micrometer click type wrench designed for years of service. The wrench is equipped with a 1/4" dual direction quick release, 60 tooth ratchet. It is equipped with a precision laser marked scale the range in adjustment is 10-50 In-Lbs in increments of 0.5 In-Lbs with a quick easy to use adjustment lock. The wrench is produced with an over molded durable chemical resistant and ergonomic comfort grip rubber handle. It has a highly polished durable bright chrome finish. The wrench is fully repairable and easily calibrated. It is calibrated to +/-3% at any setting, meets ASME B107.14B specifications, and includes a 1 year warranty. 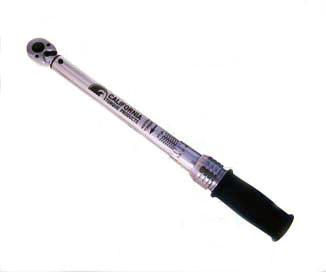 The 2001CTPRH torque wrench is an industrial grade micrometer click type wrench designed for years of service. The wrench is equipped with an over molded durable chemical resistant and ergonomic comfort grip rubber handle. The wrench is produced with a 1/4" dual direction quick release, 24 tooth ratchet. It has a precision laser marked scale with a range in adjustments from 30-200 In-Lbs in 1 In-Lb increments, with a quick easy to use adjustment lock. It has a highly polished durable bright chrome finish. The wrench is fully repairable and easily calibrated. It is calibrated to +/-3% at any setting, meets ASME B107.14B specifications, and includes a 1 year warranty. 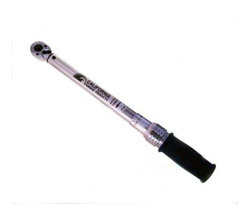 The 2002CTPRH torque wrench is an industrial grade micrometer click type wrench designed for years of service. The wrench is equipped with a 3/8" dual direction quick release, 32 tooth ratchet. With a precision laser marked scale the range in adjustment is 30-200 In-Lbs in increments of 1.0 In-Lb with a quick easy to use adjustment lock. The wrench is produced with an over molded durable chemical resistant and ergonomic comfort grip rubber handle. It has a highly polished durable bright chrome finish. The wrench is fully repairable and easily calibrated. It is calibrated to +/-3% at any setting, meets ASME B107.14B specifications, and includes a 1 year warranty. 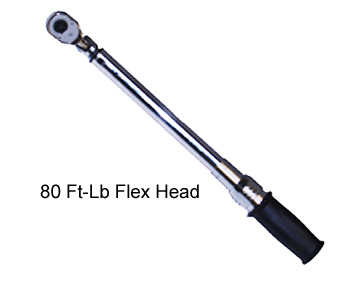 The 802CTPRHF torque wrench is an industrial grade micrometer click type wrench designed for years of service. The wrench is equipped with a 3/8" dual direction quick release, 32 tooth ratchet. The wrench is made with a flexing ratchet head. With a precision laser marked scale the range in adjustment is 10-80 Ft-Lbs in increments of 0.5 In-Lbs with a quick easy to use adjustment lock. The wrench is produced with an over molded durable chemical resistant and ergonomic comfort grip rubber handle. It has a highly polished durable bright chrome finish. The wrench is fully repairable and easily calibrated. It is calibrated to +/-3% at any setting, meets ASME B107.14B specifications, and includes a 1 year warranty. 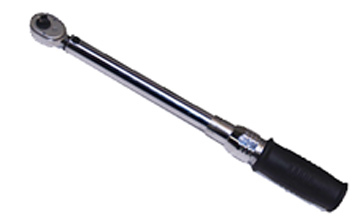 The 802CTPRH torque wrench is an industrial grade micrometer click type wrench designed for years of service. The wrench is equipped with a 3/8" dual direction quick release, 32 tooth ratchet. With a precision laser marked scale the range in adjustment is 10-80 Ft-Lbs in increments of 0.5 In-Lbs with a quick easy to use adjustment lock. The wrench is produced with an over molded durable chemical resistant and ergonomic comfort grip rubber handle. It has a highly polished durable bright chrome finish. The wrench is fully repairable and easily calibrated. It is calibrated to +/-3% at any setting, meets ASME B107.14B specifications, and includes a 1 year warranty.